Campaigners are calling for tighter legislation to end the "misery and suffering" of thousands of dogs. The Scottish SPCA is urging animal lovers to play their part by refusing to buy dogs from puppy farms. The new campaign to stop the trade in puppies comes at the end of a consultation by the Scottish Executive on the licensing of animal dealers. The charity claimed that allegations of puppy dealing had increased by more than 100% in the last year. 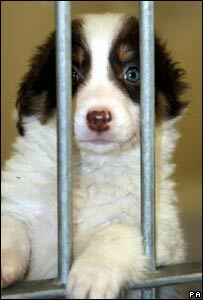 Diane Stewart, manager of the Scottish SPCA's Lothian Animal Welfare Centre, said thousands of puppies every year were being transferred in cramped conditions and sold in car-parks and lay-bys across Scotland. She said many farmed puppies were taken from their mothers too early and have infections, resulting in owners often having to have them put to sleep just days after buying them. 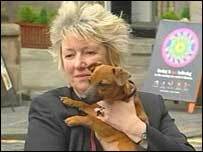 Nationalist MSP Christine Grahame, who launched a member's bill on the issue in 2003, is joining the SSPCA to launch the latest phase in its campaign. They will support proposed new legislation to impose tighter controls on dog dealers through a new hard-hitting leaflet and education campaign. Ms Grahame said: "Puppy dealing is big business. We have become increasingly aware of rising demand for purebred pets, and have been made aware of several recent cases of pedigree dog napping." She said calls to the Scottish SPCA regarding puppy dealing had more than doubled in 2006. "Breeders in Scotland are under more and more pressure to meet consumer demand and we know that disreputable dealers are filling that gap by importing young puppies from unlicensed puppy 'farms' in the Republic of Ireland and Northern Ireland," she said. "This terrible trade causes misery and suffering both for the poor young puppies themselves and for the unsuspecting members of the public that buy from these cruel dealers." She said the executive was committed to introducing tighter controls on dealers bringing in puppies for resale in Scotland. "We believe that the people with the real power to stop this terrible trade are members of the public, and we are asking them to vote with their feet today and only consider buying puppies from a reputable breeder or an animal welfare centre," she said. Ms Stewart said that in 2003 the SSPCA seized and cared for more than 100 puppies that had been transported from Northern Ireland. However, due to the inadequacies of the law, almost all of the puppies had to be returned and no prosecution could be taken. Ms Graham's 2003 member's bill received cross party support and was put on hold after the executive said it would take forward the proposals under the Animal Health and Welfare (Scotland) Act, which came into force in 2006.